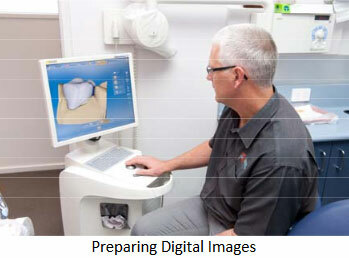 CEREC is a unique invention and procedure that allows your dentist to also be a dental technician in the surgery. Two small machines are connected to a computer system, one is a digital camera and the other is a milling machine. This procedure was developed at Zurich University and has been successfully deployed in dental practices around the world since 1985. Over the years, software and hardware enhancements have progressed and it is now possible to mill a porcelain crown in about 10 minutes. This crown is then stained, fired and glazed in a porcelain furnace for a further 30 minutes, with the resultant crown ready to be fitted at the same appointment. • This is an advanced dental science and service that we can offer our patients where tooth coloured porcelain restorations can be fabricated in one visit. • When you have a cracked, chipped or decayed tooth and a crown is recommended, we prepare the tooth by trimming 1.5mm off the circumference and top. • We then take digital pictures that are fed directly into the computer. This produces a 3D image of the tooth and a 3D picture of the crown. • This information is then transferred automatically to the milling machine and a blank, readymade ceramic block is clamped into position. The machine then proceeds to mill the crown specifically for you and your problem tooth. • The milled restoration is bonded directly to your tooth once it has been colour matched, fired and glazed. It is exciting to be involved in CADCAM dentistry from both a technological aspect and how it benefits our Blackburn Dental patients.